Inkjet prints, white glue, acrylic, tinted acrylic glaze mounted on canvas. 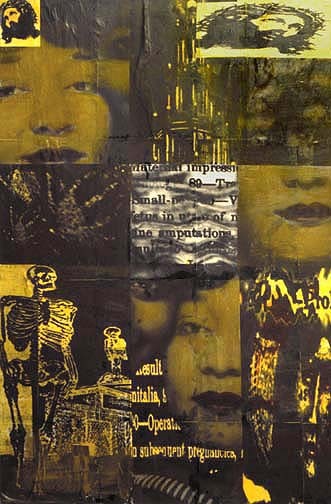 "This piece is composed of images borrowed from an old book on medical anomalies, some photo-booth shots from 1940's or 1950's of two young black women (which I found in a dump in Elkins Park, Pennsylvania), an antique post card of Jesus in his Crown of Thorns, and photos from a book about the Byzantine architecture of Saint Vitale de Ravenne. The cross-shaped composition was accidental, or at least an afterthought."